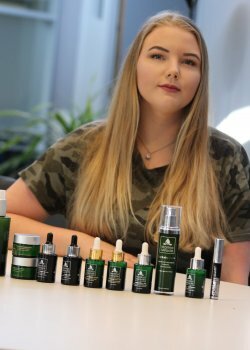 With only a few months to go before graduation, Norwegian student, Hanne Garnvik, has just started a franchise business which has the exclusive rights to sell all-natural skin-care products in the Netherlands from award-winning Norwegian brand Marina Miracle. With all the legalities out of the way, pre-sales will open this Friday, 18 May, on the new Dutch website before the official launch on 1 June. Garnvik will open the business in partnership with her Dutch boyfriend, Joost Julsing. 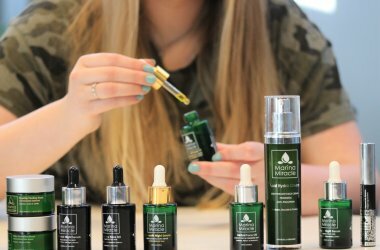 The owner of the 4-year old brand, Marina Engervik, announced mid-April on her Instagram account that the products would be launched in the Netherlands and Belgium soon. So far, they have only been available in Scandinavian countries. Hanne joined Wittenborg University of Applied Sciences in 2015. She is in the final phase of her IBA in Entrepreneurship & Small Business and lives in Apeldoorn. “I have always been interested in make-up and skin care, and we wanted to start our own company. I have used the Marina Miracle products myself for a while now and seen a real improvement in my skin because the ingredients are all-natural. It is 98% organic, vegan, cruelty-free and probiotic. All the ingredients are pure, so, for example, if it contains argan oil it is pure. The world sells 1.5 times more argan oil than it produces, which means it is often watered down with other oils, so it is not pure. Natural oils are better because they soak into your skin due to the oil that you already have in your skin. If you use chemical products, they will clog up the skin. How does she like life in the Netherlands? The products contain some exotic ingredients like argan oil, but also Norwegian ingredients like the Arctic blueberry, algae and nettle. But is there a gap in the Dutch beauty market for this kind of product? Are Norwegian women known for good skin? I thought the Koreans had cornered the market! What is the one product women should not do without in their beauty regime? What is a product you consider unnecessary in the beauty world?